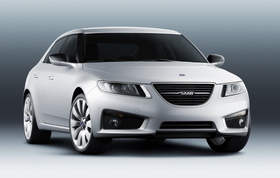 Saab's 9-5 has a bold front design. MUNICH -- Saab today released details of its new 9-5 flagship, a car crucial to the brand's success as an independent automaker under new ownership. The new 9-5 will play an important role in a product offensive that Koenigsegg plans to announce once its purchase of the brand from GM is finalized. "This car is the start of a new era for our brand," said Saab Managing Director Jan-Ake Jonsson in a statement. Saab says the new 9-5 is the most technically advanced car it has made to date with an array of high-tech features including an aircraft-inspired head-up information display, Bi-Xenon adaptive headlights, adaptive cruise control, parking assistance and all-wheel-drive. The car will be offered with gasoline, diesel or E85 bioethanol four-cylinder turbocharged engines. The most fuel-efficient diesel, a 160hp, 2.0-liter unit, has CO2 emissions of 139 g/km. The new 9-5 shares GM's Epsilon 2 platform with the Opel/Vauxhall Insignia, but the Saab version has a longer wheelbase and its own unique muscular, low-slung exterior styling and unique interior. The current 9-5 has been on sale for 12 years and its sales have declined as the car has gotten older. In the first six months, Saab built 9,061 units of the 9-5, down 72.4 percent from the year before, according to J.D Power Automotive Forecasting. Saab sold 93,000 cars worldwide in 2008. The new 9-5 has a low-slung stance.